In 1976, twenty-one-year-old Sebastian Abineri was cast in Richard Attenborough’s epic war film, A Bridge Too Far. 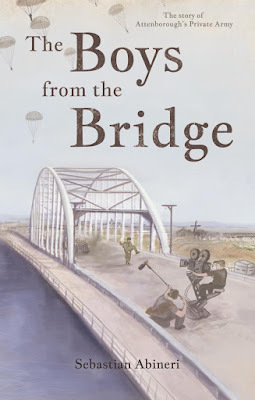 He joined “Attenborough’s Private Army” (APA), a group of fifty young British actors, who were brought together to train under the eagle eye of a former director of The SAS to represent the heroic band of Paratroopers who held Arnhem Bridge against insurmountable odds in 1944. The APA worked for six months alongside major stars such as Anthony Hopkins, Sean Connery, Michael Caine and Sir Laurence Oliver. It was one of the hottest summers on record; so hot that the APA drank the local bars dry! The Boys from the Bridge recounts their extraordinary story. Sebastian Abineri has been an actor for over 40 years and has appeared as a lead in two BBC ‘Plays For Today’. He has also appeared in The Bill, EastEnders and has played Major Williams in Coronation Street. He has also starred in theatre productions all over the country, including a couple in the West End. Sebastian is currently playing Abe Goldman in Beau Jest at The English Theatre in Vienna, Austria. Outside of acting, he runs The Movie Makers Guide, a film and movie locations database, and Act-Ed, an online, on-demand video teaching resource for media and theatre. Sebastian spearheaded the successful campaign to save Palace Theatre in Westcliff-on-Sea from closure – as a resident of the town itself.